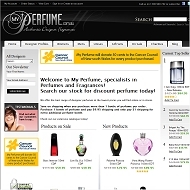 MyPerfume.com.au is an Australian company based in Sydney, New South Wales, providing the Australian market authentic designer perfumes and fragrances without the designer prices. How to save with My Perfume's coupons and bargains? Click one of our My Perfume coupon/bargain discount link and open My Perfume site. Shop the My Perfume online store. Enter My Perfume Coupon Code (When available). Use this My Perfume discount link to view the latest exclusive offers for you! Shop at myperfume.com.au Now! Huge discount sale at My Perfume via this link, with designer fragrances up to 80% off. Free Shipping store wide until the end of June. Take advantage of this massive storewide sale. This coupon last tested on June 10, 2011 by BargainSmarter user. Use this exclusive My Perfume discount link to get the latest hot deals! Click through this link for more details!